A complete new shape in combination with hollow construction. Hollow hulls have been around for decades and the performance has proven to be a design advantage. The cost to build is tremendously high but our dedication and passion for this ultimate construction is stronger than the dream to become rich. The resulting performance and durability of the hollow honeycomb carbon fiber construction is superior in every aspect. The feeling of riding a hollow board is amazing. Even better is that the feeling never changes. The resulting performance and durability of the hollow honeycomb carbon fiber construction is superior in every aspect. The feeling of riding a hollow board is amazing. Even better is that the feeling never changes. PATRIK Formula 4 “AIRINSIDE”: Superior performace and durability. With the new hollow construction we are able to adjust the internal structure and control the flex and twist of the board. In the past 5 years we have tested many combinations of internal structure and shape. With the stiffest internal structure the board rides very high on the water and feels very agressive. The perfomance improves in all aspects – better planing, more acceleration, more speed with higher upwind angle. To help control the agressive feeling we straigtened the outline, reduced the cutout depth and kept a full rail longer towards the tail. The amazing part, is that with all the shape changes the performance improved even more. The lower cutout depth helped early planing and control the lift while the straighter and fuller outline/rail makes the board more stable, easier to sail, and it keeps the upwind angle at very low speeds. The interplay between construction and shape makes this board simply a winning formula. A new rocker line with a higher nose curve prevents the front of the board from hitting the chop when going upwind. Riding downwind the board never dives in but flies over the chop with a very controlled feeling. The combination of the construction and the hydro effect of the Invert-V concept makes the board ride very high on the water. This made it possible to extend and straighten the outline a lot to improve the rail power under the back strap so the rider can keep pushing the upwind angle at lower speeds, especially right at the start and after tacking. The invert-V shape directs the water flow from the left and right rails to the center line. When the two water flows impact each other at the center line they create an upforce flow, pushing the tail up like a hydrofoil effect which lets the board ride higher on the water with less resistance. As the scoop is higher in the nose area, the overall V could be reduced so the rails still sit higher over the water but the center line is less sharp and less directional. The wide double bevel raises the rail even higher, so they almost never touch the water even on a very deep downwind course. The new deck shape is lower around the masttrack which gives more control to the board. The deck shape at the downwind strap, (chicken strap), is angled and allows for a more comfortable stance. The width of the board at the front foot is narrower which makes the board feel wider in the tail. To increase the push at the back foot even more the rail thickness was increased at the back strap. The overall boxy rail throughout the whole board prevents the rails from diving into the chop on the downwind course. With the finbox at 9cm the board has a lot of surface behind the tail which helps the early planing and keeps the nose down in strong wind. The complete new shape allowed for the straps to be moved back even more. Moving the straps further back means that the pivot point of the board moves forward making it easier to drive the board upwind. New geometry and depth to balance the whole new shape and construction concept. 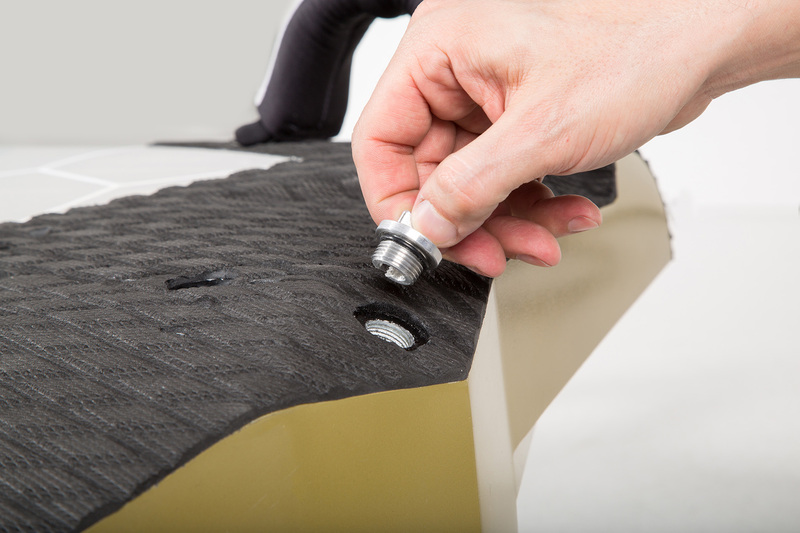 We offer adjustable plates for riders who want to tune the board to perfection. For those who think they need more pressure under the back foot, the adjustable wings are the way to go. Hollow boards have been around since the very beginning of windsurfing history and have always proven to be the highest performing construction. Besides the advantages of the light weight and the stiffness, flex and twist can be controlled with the internal structure. The interaction between internal structure and shape is key for superior performance. Over 5 years, Patrik has tested hundreds of combinations between construction and shape, and the product we are able to offer today is the most advanced in the market. With our R&D team we keep testing many more combinations and keep pushing the performance and quality standard to an even higher level ever year.